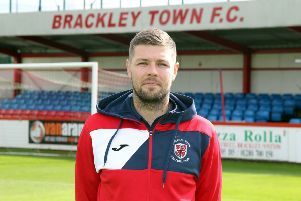 Brackley Town boss Kevin Wilkin saluted fans’ favourite Steve Diggin after he kept his side in the contest during Sunday’s Buildbase FA Trophy final penalty shoot-out. Diggin had to score to keep Saints in contention after they trailed early on in the penalty shoot-out with Bromley at Wembley. He did and moments later Saints were the winners thanks to Andy Brown’s winning spot-kick. 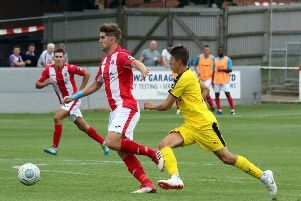 Wilkin said: “My heart was beating a bit faster in the penalty shoot-out, having been on the wrong end of one in my last final here. You think it may not be your day again and you won’t get the break. “But Lady Luck was shining on us when Omar Bugiel hit his spot-kick over the bar. “The players showed their resolve, especially Steve Diggin and Glenn Walker when it mattered. Steve hasn’t had a lot of game time this season so to step up and take his spot-kick like he did showed immense character.